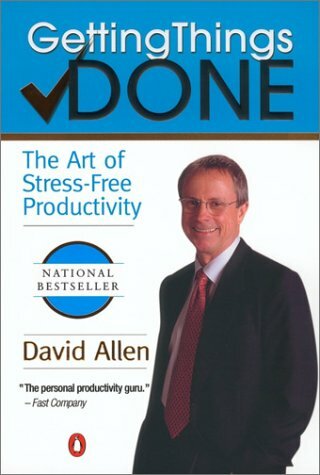 I have started reading Getting Things Done (GTD) by David Allen. Now, I read all my books while traveling – in buses, trains, rickshaws – and there are, well, some books that I like to flaunt more than others; like Darwin’s Origin of Species, of which I managed to read about half a page. On the other hand, I tried to hide GTD. I can feel eyes of fellow-passengers peeking at the book; their minds thinking “Oh… this guy is in need of self-help. Loser!”. And why do I know this? Because it is exactly the same thing I think when an eager-beaver holds up Shiv Khera’s You Can Win proudly in the local train — “Hide that you idiot!”. Some things – like your profound appreciation of Kyunki Saas Bhi Kabhi Bahu Thi – should best be left in the closet. So, why did buy this book? For one, I am not prejudiced against the self-help genre. But I am aware that bulk of the books are have nothing original to say. In fact, the only self-help book I read was the excellent Seven Habits of Highly Effective People by Stephen Covey. There are other good ones which I have never got around to reading, because there were other things to read. But GTD struck a cord because the main point David Allen makes is something I have been pondering about — meaning I have recognised the such a problem exists, but haven’t gotten around to defining it yet. It is very easy to act busy when you are working in an organisation — you can always blame the routine work for not implementing that great idea you had… something that is fulfilling like a trek, or gyming, or photographing. But when I was freelancing there was no ‘routine work’ to fall back on. I realised that my implementation of ideas close to my heart was abysmal. And why was it difficult? Because I stopped at the ideating stage, content romanticising about the final product. Result: at the end of the week I would have achieved nothing. What GTD suggests is that instead of ideas, think in terms of action to implement the idea. This is primarily what attracted me to GTD. Another compelling reason was that this book and its author were featured in Wired which I hold in high esteem. This entry was posted in Personal and tagged books, david allen, Personal, self-help. Bookmark the permalink. most of self help books carry too much dogma. seven habits is probably the best self help book and I stopped reading self help books after that. is one of the best management books I have read.